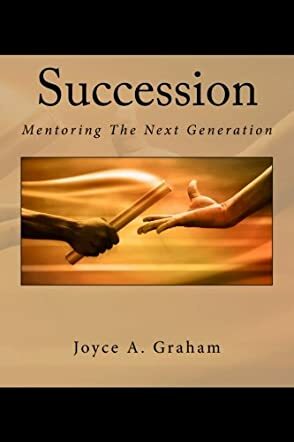 Succession: Mentoring The Next Generation by Joyce A. Graham is an invaluable text of current day and biblical examples of the role of a leader and mentor through the ages. With role models such as Moses in both the leadership as well as mentor role, the reader learns the cross-over effect of both positions. One will not work effectively without a thoughtful transition into the corresponding position. Without the disciples, Jesus was not ready, mentally or emotionally, to endure his sentence of crucifixion. Graham addresses the issue of resistance among successors and mentors that results in poorly executed transitions of power. Noting examples of well-known and established religious leaders, the reader is given a very clear picture of effective “passing of the baton” from successor to mentor in order to create an uninterrupted format of leadership. Graham consistently reiterates that a leader can never “retire” from God’s purpose. Once a leader, always a leader. As stated by Dr. Myles Munroe: “The greatest obligation of a true leader is to transfer a deposit into the next generation. The worst mistake a leader can make is to mentor no one, choose no successor, and leave no legacy.” Dr. Munroe goes on to highlight the fact that “The greatest act of leadership is what happens in your absence. If everything you’ve done dies with you, you are a failure. True leadership is measured by what happens after you die. Successful succession can only occur when a leader prepares for the next stage of leadership. Succession: Mentoring The Next Generation is a powerful look into the fundamentals of all leadership positions, whether political, personal, or governmental. Succession is well worth the read. I really enjoyed reading this book. The author’s use of relatable vocabulary, the addition of a glossary and appendix, and her common sense approach to her topic make this not only an educational tool, but an interesting volume for perusal. In Succession: Mentoring the Next Generation, Joyce A. Graham tackles the crucial topic of mentorship and succession. Unlike secular organizations, many churches do not have a well thought out strategy that addresses the mentoring of the person next in line for them to successfully take over the position of the former leader. To fully explore the matter and provide insight, Graham takes a few case studies and investigates the challenges in each style of succession, and includes what was done wrong while considering what can be gleaned in each case. In addition to the modern day scenarios, she also explores biblical accounts which are related to the topic. Some of the characters who appear in the book include Moses and Joshua, Jesus and his disciples, as well as Paul and Timothy. One of the best features of Joyce A. Graham’s book In Succession: Mentoring the Next Generation is that the topic it addresses is very important in any organization. Many great ministries have fallen during the time of succession which further shows the significance of the message. Graham also presents modern-day versions of succession as well as some from the Bible. This blend illuminates the key elements of a successful succession and the role of mentorship in the process. I liked the style of the book where real scenarios are used to offer insight into the topic. The cases are interesting and eye-opening. Succession: Mentoring the Next Generation is a book that every leader needs to read and more so those that head churches. Succession is a process by which one person or one group of people can be replaced by an entirely new person or group. It’s a process that’s necessary for the advancement of any entity, but especially when it comes to the church and other ministerial type work. It’s important that everyone within the ministry understands the process of succession and the reasons why it’s so important, but even more, it’s important that each person is capable of aiding in the mentoring process that creates the best new leaders for the church or for any aspect of the field. In Succession: Mentoring the Next Generation by Joyce A. Graham, you can truly understand the path that anyone in the ministry can take to lead others toward a future of beauty and wonder that helps to fulfill the purpose that God has given in each person’s life. If you’re looking to better understand what it takes to really create a strong and ready team within the ministry, then you’re definitely going to want to read Succession: Mentoring the Next Generation by Joyce A. Graham. This is a book all about the process of becoming a true leader and of molding the next generation of leaders within the ministry as well. After all, building the way forward is a difficult process. It can be done if you know the steps and, even more, if you can understand the way that succession has occurred throughout history. Whether it’s in the business realm or the general public or it’s within the Bible, there have been a number of different famous and successful successions and you can create one for your ministry as well.